Haven’t tried this yet, but it looks yummy. You might make this as a special treat today to cheer people up on this glorious tax day. Preheat oven to 400 degrees. Mix everything togher and pour into an unblked 9 inch shell. Sprinkle The top lightly with nutmeg. Bake 15 minutes. REduce over to 350 derees and bake 43 minutes. Cool to allow filling to set. 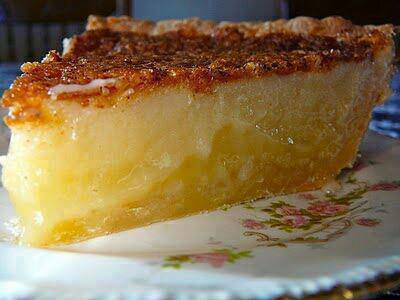 That looks amazing and is the 2nd recipe I’ve seen today for buttermilk pie. Guess I have to make one. Anxious to hear what you think of it.